BARBERVILLE, Fla. – Feb. 15, 2011 – Clint Bowyer capped off a huge night for DIRTcar UMP Modifieds at the 40th DIRTcar Nationals by University of Northwestern Ohio on Tuesday at Volusia Speedway Park by capturing the overall championship following Triple 25 features. With a buzz surrounding them since last week thanks to local media attention, Ty Dillon and Austin Dillon closed out the DIRTcar UMP Modified portion of the DIRTcar Nationals Volusia the best possible way possible as they each won a feature in addition to Ken Schrader. Austin Dillon claimed the first hotly contested feature by holding off Bowyer and Peyton Taylor for the win. Dillon’s blistering pace allowed him to stretch his lead to nearly half a track before caution flags negated his work. Bowyer clinched the overall DIRTcar Nationals by UNOH championship on the strength of three wins over the eight nights that DIRTcar UMP Modifieds raced. Bowyer rattled off a third-place finish in the opener and followed that with two consecutive victories, missed a night due to obligations at Daytona International Speedway, finished second in ‘The Gator Championship’ before running second to Dillon in the final night of racing. “I appreciate everyone coming out here to Volusia and supporting dirt racing,” said Bowyer, who will be one of 42 drivers to run the Daytona 500 on Sunday. Ken Schrader led all 25 laps in dominating the second DIRTcar UMP Modified Triple 25 feature. Schrader, a former DIRTcar Nationals UMP Modified Champion, wound up second behind Bowyer in the overall DIRTcar Nationals standings. Fellow Missourian, Kenny Wallace charged to a second-place finish ahead of Bobby Kitchen, Bobby Regot and Dave Wietholder. Finally, it was Ty Dillon’s turn to equal his brother’s performance from earlier in the night. Dillon, who on Monday night won ‘The Gator Championship’ at Volusia, grabbed the lead on Lap 4 when he motored past Richie Tosh. Dillon avoided a mid-race close call when he clipped a slowing car exiting the track in front of him, causing damage to the nose of his University of Northwestern Ohio Modified. Ty then hold off a furious onslaught from Michael Long before pulling away from the field with five circuits remaining to capture his second DIRTcar Nationals by UNOH win. 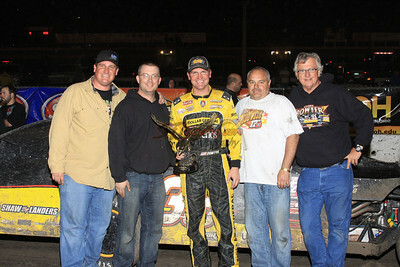 CLICK HERE FOR MORE PHOTOS FROM THE DIRTcar NATIONALS! Triple 25 #1 (25-Laps): 1. Austin Dillon, 2. Clint Bowyer, 3. Peyton Taylor, 4. Mike Spatola, 5. Chris Puskas, 6. Ryan Gifford, 7. Todd Sherman, 8. Dave Baldwin, 9. Carl McKinney, 10. Jeff Thomas, 11. Dave Jamison, 12. Dale Murray, 13. Mark Grosvenor, 14. Johnny Broking, 15. Jeremy Kerzman. Triple 25 #2 (25-Laps): 1. Ken Schrader, 2. Kenny Wallace, 3. Bobby Kitchen, 4. Bobby Regot, 5. Dave Wietholder, 6. Jason MIller, 7. Tony Anderson, 8. Larry Burkins, 9. Andy Strait, 10. Kevin Davis, 11. Evan Taylor, 12. Jason Beaulieu, 13. Brett Korves, 14. Kip Hughes, 15. Weasel Rhodes. Triple 25 #1 (25-Laps): 1. Ty Dillon, 2. Michael Long, 3. Bob Broking, 4. David McWilliams, 5. Brandon Smith, 6. Terry Hull, 7. Bob Gierke, 8. James Smith, 9. Jamie Carter, 10. Keith Smith, 11. Richie Tosh, 12. Gavin Landers, 13. Lawrence Oconnor, 14. Gary Brooks, DNS. Kody Weisner, DNS. Terry Hansen.